The Eiskoffer Bending Tool is perhaps the most comprehensive tool kit ever created for those looking to outfit their PC with HardTubes. All the tools, angled pieces, and other products required for bending HardTubes can be found in this case. The Alphacool Eiskoffer is perhaps the most comprehensive collection of tools for bending 13mm or 16mm diameter HardTubes into nearly any form ever assembled. 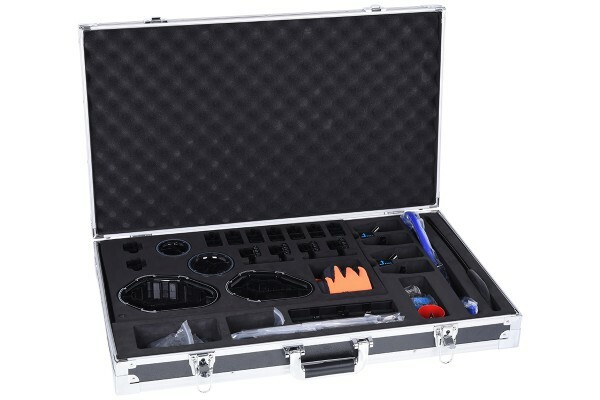 Inside the large, elegant, and sturdy case, each tool has its own separate place. All the tools are clearly arranged and neatly organised. The rubberised gloves ensure you always have a good grip on things, while also protecting you from splinters and dirt. The deburring tool is perfect for smoothing down HardTubes. Deburring is mandatory if you want the HardTubes to fit into their connectors properly. A long, sturdy saw and a mitre box serve to simplify cutting the HardTubes. The mitre box can be fastened to a table edge with special screw clamps, which are included. The inside of the mitre box is rubberised to prevent scratches and to keep the HardTubes from sliding around. The comprehensive set of measuring tools makes it easy to measure not just length, but also two or more angles at the same time. This tremendously simplifies the planning and execution of complicated bending sequences. In order to get the perfect bend each time, a substantial palette of bending radii and angles can be attached to the bending plate. The basis for this is formed by two different sizes of bending mandrels and arc mandrels. This allows you to bend HardTubes to any classic bending radius. The fitting stoppers can be used to simulate the depth of an Alphacool fitting on the end of the tube. This means an exact measurement and a perfect bend are always guaranteed when using Alphacool products. Alternatively, the straight mandrel with a stylus stopper can be used if you are using other products. The bending plate has a section that can accommodate self-designed or highly specialised bends. The case contains special flex mandrels that can be positioned in nearly any way. You need a 30° angle followed by a 2cm long straight section and then another 20° angle? No problem; these flex mandrels make just about anything possible. That’s not even getting into the real highlight: instead of just bending on a 2D plane, Alphacool has included flexible 45° and 90° mandrels in the case. These make it possible to take a bend from horizontal to vertical. The flexible angles also make it possible to bend tilted angles. That means angles don’t just have to be bent straight up, but can be rotated around 180° horizontally. The corresponding angle ruler helps to set up the angles you need. To finish off, silicon inserts for HardTubes with 13mm and 16mm diameters are included. A complete manual showing all the functions and bending possibilities of the Eiskoffer is available for download on the Alphacool website. Bummer I was excited and was going to purchase this, but I guess i'll have to look elsewhere. thanks for the quick response. Will this come back in stock or has it been discontinued? If it will come back, is there an ETA? Yes it will. Every ETA will upload soon as possible by our webside, so you can leave your email or phoneno to become an notification when it will available again. 18 Beoordeling (en) in andere talen. The Alphacool Eiskoffer is the best bending kit ever. Everything is included, and what I liked most about it is the professional packing. Every tool has de dedicated place to go back to. Great. Der Alphacool Eiskoffer ist total gut durchdacht und fein aufgebaut. Ich mag eigentlich alles darin. Als ich ihn geöffnet habe hat mich die krasse Masse an Teilen erschlagen, es ist wirklich alles drin woran man hätte denken können und bei ein paar Teilen frage ich mich noch immer ob ich die jemals tatsächlich nutzen werde. In the past I used to recommend the Monsoon bending kits, but now this has changed. The Alphacool Eiskoffer ist my no 1 choice. I like the Alphacool Eiskoffer very much! It is my number one choice for a bending kit, the box is solid, inside everything is professionally sorted, and the massive number of tool is crazy! Only what I missed was the heat gun and as I only have one size of tubing I wonder why already there is everything included for 13 and 16mm. Das ist nicht nur der Hammer, sondern der ganze Werkzeugkasten! Alles was man braucht zum Biegen. Sehr zu empfehlen! Ich finde es sehr super das es nun einen Koffer gibt, wo gleich alle benötigten Artikel zum biegen drinnen sind. So erspart man sich das zusammen suchen. Mit den Alphacool HardTubes funktioniert es einwandfrei. The bending tool of my first choice! Hammer Produkt, hätte nicht gedacht, dass Hardtubes biegen so einfach sein kann. It costs some time more than a simple bending tool, but for precise results, you will definately need the Eiskoffer. Even the gloves fit to my hands, and once I found out how easy it is to bend a tube and how the base plate is supposed to work I can only recommend it. Beautiful set. I'm extremely impressed with this kit. Everything seems very high quality and well thought out. This definitely seems to be the most complete kit available to date. The only thing I found is that the gloves are rather small, which works for me as I have small hands. Regardless, I can't recommend this kit more highly than I am now, this thing is an amazing kit. I like the way how this is supposed to work. Amazing that I can bend the hardtube while mounted on the plate. Even the plastic carbs do not melt, do not even get soft - what an amazing material is that? Ich finde es sehr gelungen, dass man direkt auf der Platte das Rohr erhitzen und biegen kann, sogar korrigieren kann. Ich habe mehrfach mit Hardtubes gebogen, und wenn man einen 90° Winkel erstellen wollte, dann ist es häufig nur 88° oder 92° geworden. Abgesehen von den ganzen zerstörten Rohren (früher) wegen Blasenbildung und "falschen" Winkel kann ich hiermit nun perfekte Rohre biegen. Ich habe noch nicht alle Funktionen ausprobiert weil es einfach so viele Möglichkeiten gibt sich eine Strecke zu biegen. Obwohl ich auf die 13mm Rohre stehe, finde ich es super dass auch die größeren 16mm Rohre sich mit dem Set biegen lassen. Also alles in Allem bin ich wunschlos glücklich. This is incredible - whoever has thought this our is agenious. Unfassbar dieser Koffer!!!! Ihr habt wirklich an alles gedacht - ich bin begeistert. Ich war skeptisch ob man mit der Heißluftpistole direkt an den Acetal Formen biegen kann, obwohl es im Video des Herstellers zu sehen ist. Aber es funktioniert wunderbar. Das Brett auf dem man alles montieren kann ist relativ schwer und stabil, was ich super fand. Eigentlich bin ich ein bisschen überfordert mit all den Tools die einem unglaublich viele Möglichkeiten geben seine HardTubes zu biegen. Auch die vielen Lineale die man miteinander verschrauben kann sind extrem hilfreich. Und das Beste, nach getaner Arbeit kann man alles wieder sauber im Koffer verstauen.